Do you enjoy frequenting sporting events or trade shows? Make your experience pleasant and memorable with this pop up tent. 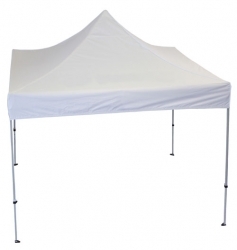 Offering fast shade, the tent's folding design allows for quick set up and take down. The collapsed tent easily fits into the trunk of most cars and includes a stake and rope kit. The 500 Denier polyester top is water resistant and provides 100% UV protection, while the sturdy 40MM aluminum frame includes 1" x 1/2" trusses for extra stability. The legs feature a handy thumb release button and can be adjust to suit your height needs.